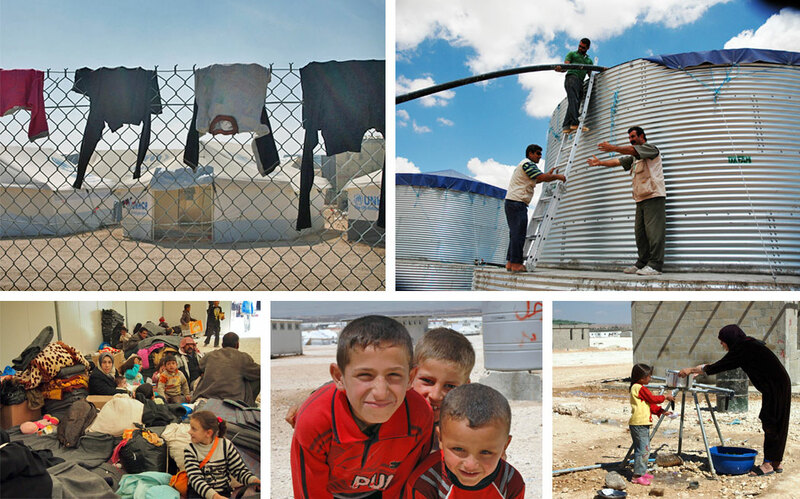 Before I arrived in Jordan, Zaatari Refugee Camp in my mind had taken on almost mythical proportions. I had heard that it was initially constructed to accommodate a population of 35,000 but was now rumoured to have a registered population of more than 130,000. And frighteningly, not the largest refugee camp in the world. As I approached by car, it seems strange to say but I was disappointed by first impressions. Zaatari refugee camp sits atop a relatively flat landscape not far from the Syrian border and without an aerial view the sense of scale I had imagined was impossible to view. Surrounded by a high wire fence for security, it appears orderly with its seemingly evenly spaced rows of regulation refugee tents. It is solid underfoot too with crushed stone to prevent muddying caused by vehicles and human traffic in winter rain. And either side of the road that leads from the main entrance is a remarkable array of market stalls selling everything from fruit, vegetables and cooked food to clothes and toys and household basics sourced from local traders outside the camp. The refugees from Syria have proven themselves to be remarkably self-reliant and resourceful. “It doesn’t seem that bad,” a companion commented. 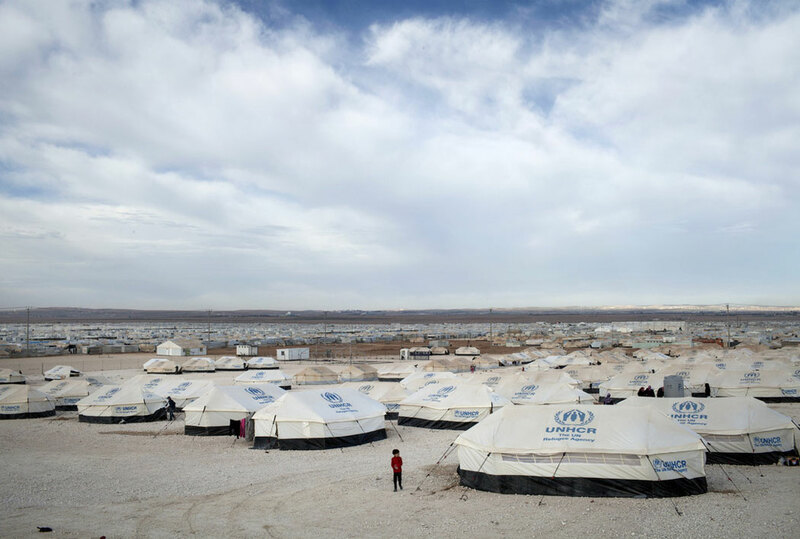 Indeed there is much about Zaatari that on first appearances “doesn’t seem that bad”…if the alternative is to be trapped in a bitter conflict that has left an estimated 70,000 dead and forced another 6 million (yes, million) people to flee their homes. First impressions too of course can be deceptive and as the morning and hours passed, the realities of life in the refugee camp became more apparent…more than anything else the sense of confinement, the restricted space, the lack of opportunity to escape even for just a short time from the heaving bustling hive of activity. Clockwise from top: Clothes drying on a high-wire fence in the camp. Caroline Gluck/Oxfam. Oxfam public health staff put the finishing touches to 95,000 litre water tanks that will considerably increase the water storage capacity in the refugee camp. Karl Schembri/Oxfam. A woman and child gather water in the camp where Oxfam has installed tap stands and towers, latrines, bathing areas, laundry areas, water collection points and wash blocks. Caroline Gluck/Oxfam. Syrian children in the camp share a smile. Karl Schembri/Oxfam. Syrian refugees arrive at the camp, originally built for 35,000 but now accommodating more than 130,000. Caroline Gluck/Oxfam. And as we moved beyond the road that once formed the main axis of the camp, it is with regret that I say my expectations of scale were finally met. Row upon row upon row of tents dominated the horizon as far as the eye could see. This was no camp. This was a sprawling city, ironically the significance of which is only best understood when you see the enormity of the blank canvas of land that has been cleared to accommodate still more tents and, more recently, prefabs. Later, faces pressed against the fence outside a health clinic where lines of mothers and young children queued served only again to re-enforce the sense of claustrophobia and suggesting that, despite best efforts, supply of services had outstripped demand. It could hardly be otherwise. Organisations like Oxfam are working closely with the refugee population to provide access to the most basic of human needs such as clean water and washing facilities but the scale of need is frankly overwhelming…1,500 people arrive on average each day. I wondered how we in Ireland would cope with such an influx. More importantly still, how do the Syrian refugees cope? Refugee camps are rarely constructed as homes but places of temporary refuge until it is safe to go home or some alternative option is found. Almost as though lives can be put on hold while diplomats, like economists, trade options...and futures...of those whose recent past, and perhaps even lives, have been comprised of choices few of us could ever even conceive. As I write now amidst a flurry of international activity to bring about a resolution to the conflict, I hear that the influx of refugees across the border into Jordan has almost ceased. And then the question, why? And quickly the realisation that those in Zaatari are the lucky ones...they were able to flee. And it is then you understand the true meaning of “it doesn’t seem that bad”.